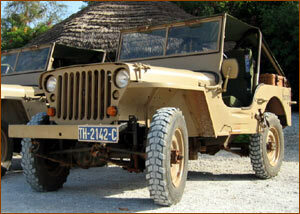 Reve d'Afrique: your off-road experience in Willys Jeeps in Senegal: adventure, charm and authenticity. A military vehicle produced during the 40s and 50s, the Willys jeeps were constructed by several factories throughout the world including the French “Hotchkiss”. The jeeps we supply you with come from the French army where they were still in active service during the “Minurca” operations..
After stripping them down completely, they were fully reconstructed according to very strict safety standards. The brakes, bearings and rings have been replaced. The bodywork has been completely reworked and a more civilian aspect has been adopted to avoid resembling a military convoy on our rallies. Roll bar and 4 point seat belts (the vehicles have no doors). The “bikini” type cover takes only five seconds to remove. Adjustable and more comfortable seats. Warm sand colour scheme and leather accessories. Of course, the windscreen folds down and all the accessories such as jerry cans, and fittings for holding spades and axes have been retained. Each vehicle is equipped with a Motorola sender/receiver so the assistance team can be contacted at any moment. Your navigation instrument is a “Garmin Geko” GPS which records your movements. We take the readings at the end of the day so we can calculate the rankings. All the mechanical aspects have been replaced by a Peugeot engine, gearbox and transmission. The engine is a diesel four cylinders of around 65 HP. The gearbox is five speed 504. Transmission can be decoupled and has short and long gears. Torque is greater than on the original versions. The diesel tank has been fitted at the back and all the feeding system has been revised. The electrics have been completely reviewed. The finished vehicle can withstand any obstacle and there is no comparing the comfort with modern small vehicles. The vehicles are fun to drive and in just a few minutes you will be completely at ease on the tiny tracks in Senegal. You will soon understand why the myth of the “Willys Jeep” is so popular with connoisseurs.